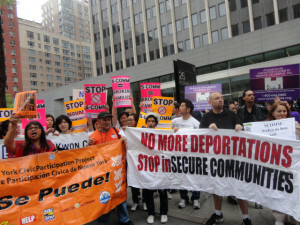 A government program that has state or local police share fingerprints of the people they arrest with federal immigration officials drew protests in New York on Monday, a day ahead of its expansion statewide. U.S. Immigration and Customs Enforcement is seeing the “Secure Communities Program” as a key tool for finding and deporting the criminal illegal aliens that are it’s priority, the agency said. To opponents, the information-sharing program, introduced in 2008, invites racial profiling, deports people for minor crimes and actually makes communities less secure by cooling relations between immigrants and police. Those concerns led Democratic Gov. Andrew Cuomo to suspend New York’s participation in the program last June after about half the state’s counties had adopted it. But a law enforcement official familiar with the program said it will launch in the rest of New York, along with Massachusetts, Arkansas and Wyoming, on Tuesday. The official spoke on condition of anonymity because they weren’t authorized to discuss the program. Emma Vidals, a 50-year-old Mexican immigrant who has lived illegally in the United States for 20 years, said she is afraid to call the police. The Associated Press reported in February 2011 that President Barack Obama’s administration pitched Secure Communities participation to local officials as voluntary, until some refused to participate. Then the federal government made it mandatory. Last August, ICE Director John Morton sent a letter to governors terminating agreements with states to clarify that such agreements weren’t necessary as the agency moved to implement the program nationwide by the end of next year. Cuomo’s office didn’t immediately respond to requests for comment Monday. Manhattan Borough President Scott Stringer predicted the program would lead to deportations of thousands of productive and legal immigrants while costing the state millions of dollars. “A state’s participation in a program that targets its own residents should be left up to local officials and not dictated from on high by Washington,” Stringer said. Communities routinely send fingerprints taken from people booked into jails or prison to state agencies for criminal records checks and states forward the prints to the FBI to check criminal histories. Under Secure Communities, the FBI shares the prints with the Homeland Security Department to check them against immigration files. Immigration officials then decide whether to pursue removal or other action. ICE credits the program for the deportation of more than 135,000 convicted criminal aliens. Officials said they’ve made changes to the program in response to states’ concerns, including developing civil rights training for police and creating a public advocate position. As of May 11, Secure Communities was active in 2,792 jurisdictions in 48 states, with complete coverage in 40 states, ICE said. This entry was posted in Press (New York) on May 15, 2012 by Ian.